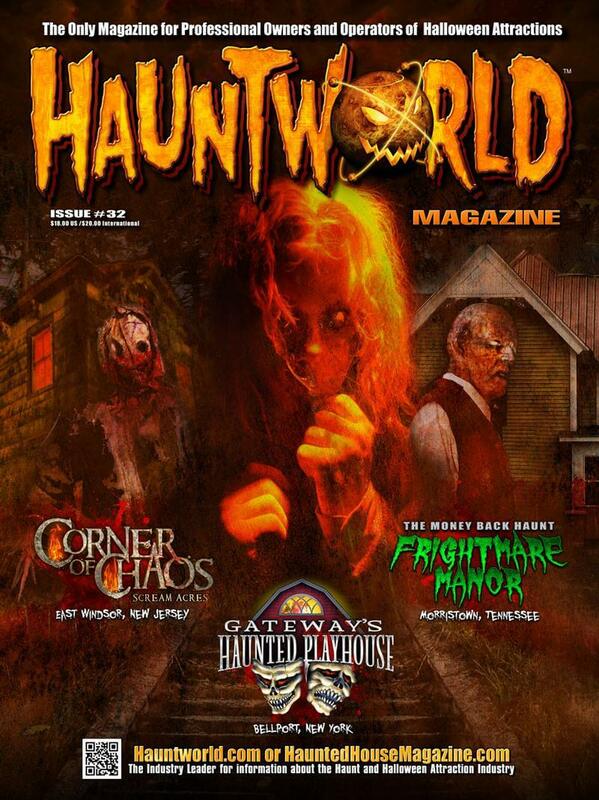 BUY a subscription to Hauntworld Magazine TODAY. Your subscription will start with the current issue or the next issue. You will recieve four issues per subscription. Issues are full color anywhere between 50 pages to 100 pages. Each magaizne is jam packed with articles from the best industry minds offering how to tips on marketing, building haunts, scares, and much more. 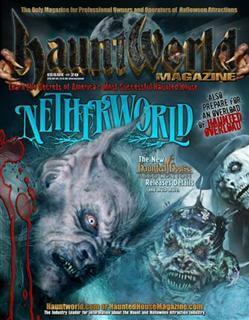 Hauntworld Magazine 48 is one of the biggest magaiznes we've ever produced. Several haunt features, learn all about flying rigs, how to open your haunt year around and starting a Christmas attraction. Issue 47 features four different haunted houses, and how to articles about digital marketing, creating radio commercials and how to create signs for your attraction. Get this full color 48 page issue today! 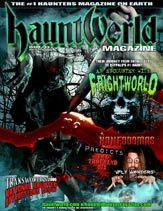 The latest issue of Hauntworld Magazine will feature all the haunted happenings for the Transworld Show along with multiple featured articles. This issue we cover the famous Queen Mary and their haunted events along with Woods of Terror from North Carolina. 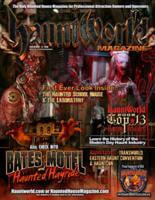 Hauntworld Magazine will also features several articles to help haunt owners expand, and increase profits. One article presented behind the team from Queen Mary will talk about how they offer beer sales to other upsales to generate hundreds of thousands of additional revenue. The staff of Hauntworld will also write an article that deals with coorporate haunts and amusement parks hurting the small haunt owners. How can you deal with corporate invaders? How can you compete with major amusement parks? 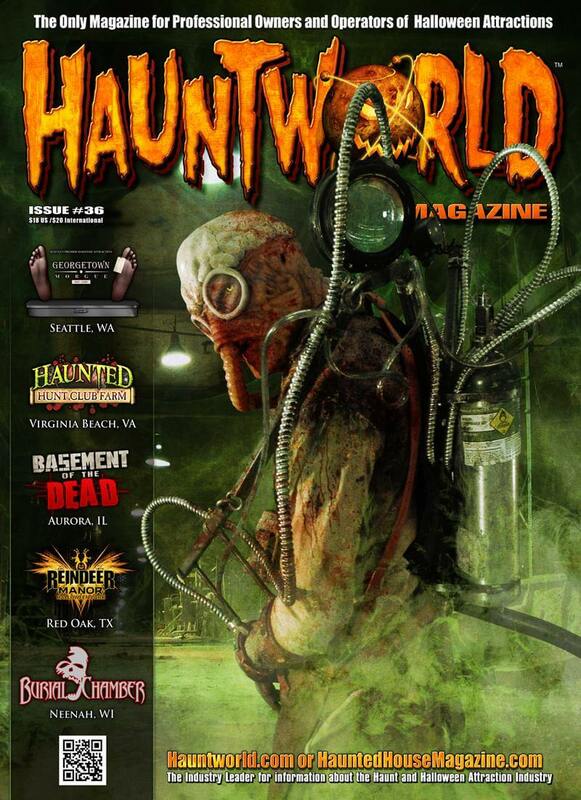 Hauntworld Magazine features three haunts including Trail of Terror, Statesville Haunted Prison and Brighton Asylum. Hauntworld Magazine issue 45 is jam packed with information to help you create a digital marketing plan to increase attendance. Get your issue now! 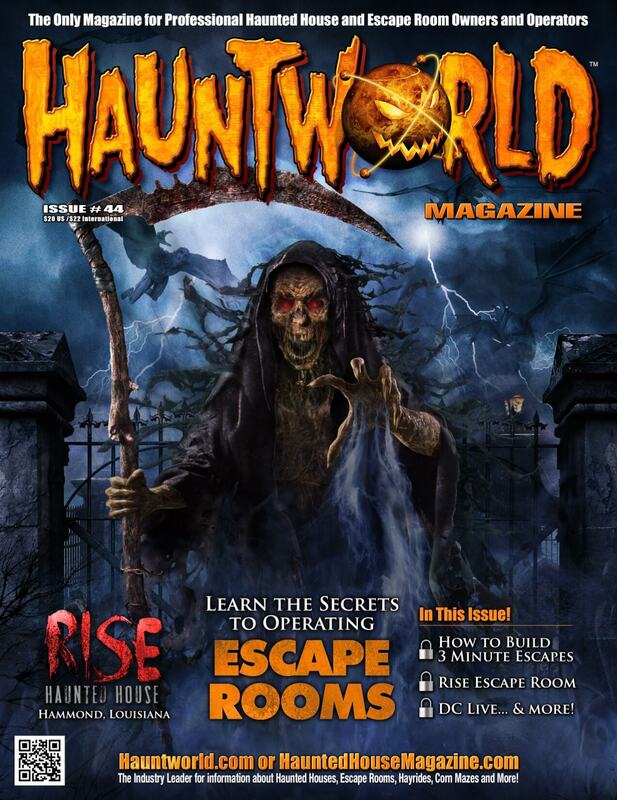 Hauntworld Magazine Issue 44 features Rise Haunted House, Rise Escape Room and a review of DC Escape Live. Additionally learn how to build a 3 minute escape room, top 10 tips for operating a successful escape room plus much more. Other articles feature security information for your haunted house and learn secrets to sell more online tickets. Jam packed issue. 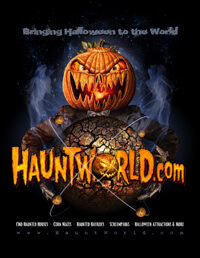 Hauntworld Magazine is now the industry magazine for haunted attractions, hayrides, escape rooms, corn mazes, and anything related to Halloween. 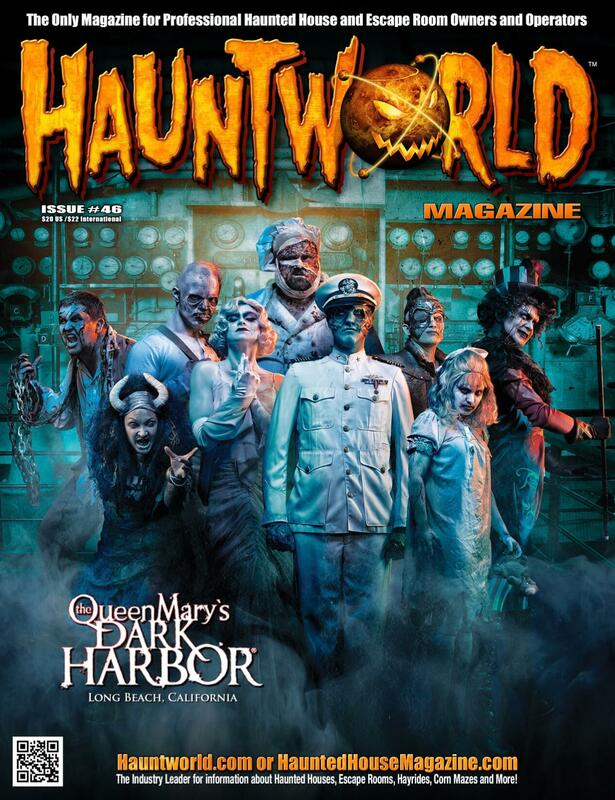 Hauntworld Issue 42 offers feature articles of Factory of Terror and Nightmare Nashville plus how to articles from Haunted Overload and much more. 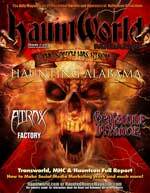 Hauntworld Magazine Issue 41 is finally HERE! Issue 41 is our best issue EVER because we focus on teaching you HOW to operate your haunted attraction in a year around setting. Learn how to utilize your attraction year around to generate income from Escape Games, Zombie Laser Tag to Christmas Shows. Learn everything inside issue 41. Hauntworld Magazine Issue 40 might be the single best most educational magazine we've produced as this issue helps you start your own escape game, high tech lighting for outdoor haunts, and an article from Larry Kirchner on how to get the edge on your competition this Halloween season. The issue also includes new products from vendors, a featured haunted house article and much more! 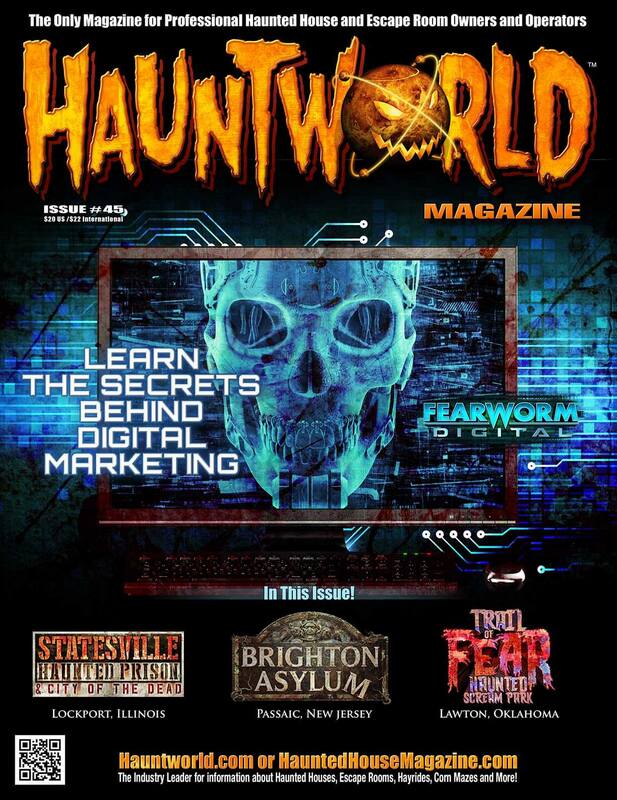 Hauntworld Magazine Issue 39 features several how to articles to help your haunted house business including how to set up retail, how to do make up quickly, haunted hayride safety, and social media marketing. Issue 39 also features Legends of the Fog, and extreme haunts feature. 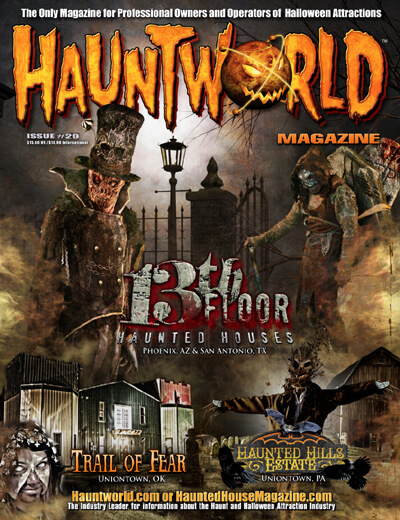 Hauntworld Magazine issue 38 features five different haunted house, articles on how to build your own 3D haunted house, state of the industry and much more. Each magazine helps you learn how to own and operate a successful haunted house. 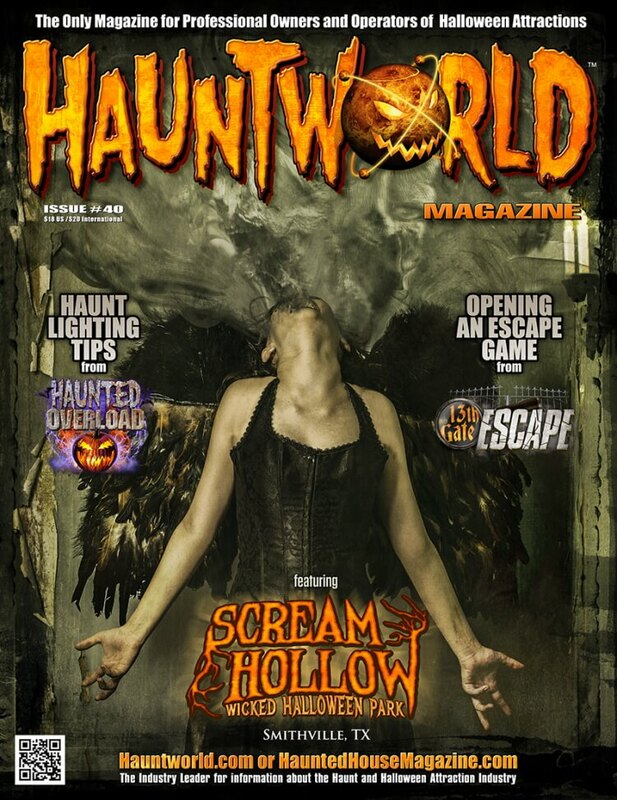 Hauntworld Magazine issue 37 features four haunted attractions plus learn marketing tips for your haunt, plus the main focus is about EXTREME haunted houses the do and the dont. Get this issue now. Released July 20, 2014. Hauntworld Magazine Issue 36 features 64 full color pages of content to help haunt owners grow and develope their business. Featured articles from Larry Kirchner, Ben Armstrong, and Dwayne Sandbugh including how to renovate your haunt article plus five featured haunt profiles. 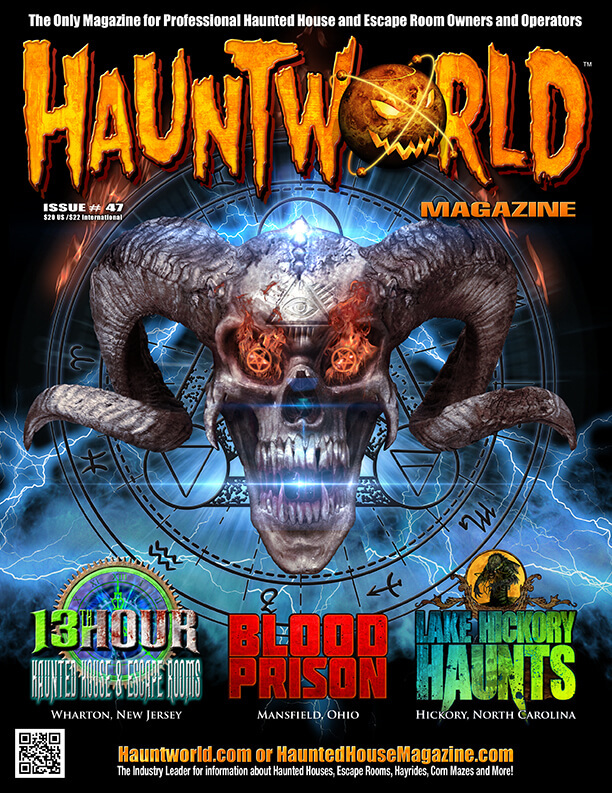 Hauntworld Magazine Issue 35 is jam packed with 5 haunted house features, how to create your own corn maze, secrets to create online web traffic and all the details about the haunt shows and tours. 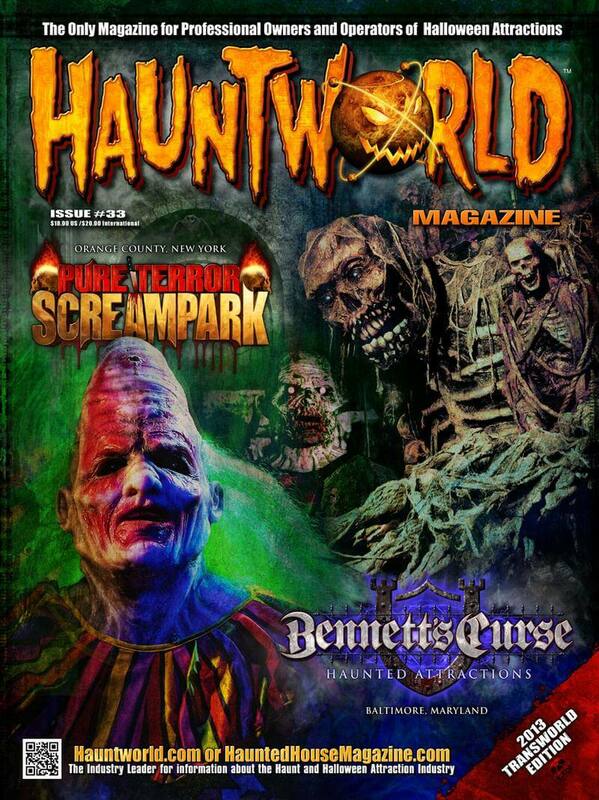 Hauntworld Magazine Issue 34 is a special edition with focus on how to be succesful owning and operating SCREAMPARKS! Learn what types of attractions, what to charge, when to open and how to operate a haunted Screampark. Featured haunts including Verdun Manor, Dead End Hayride, Darkwood Manor and 100 Acres Manor plus much more. 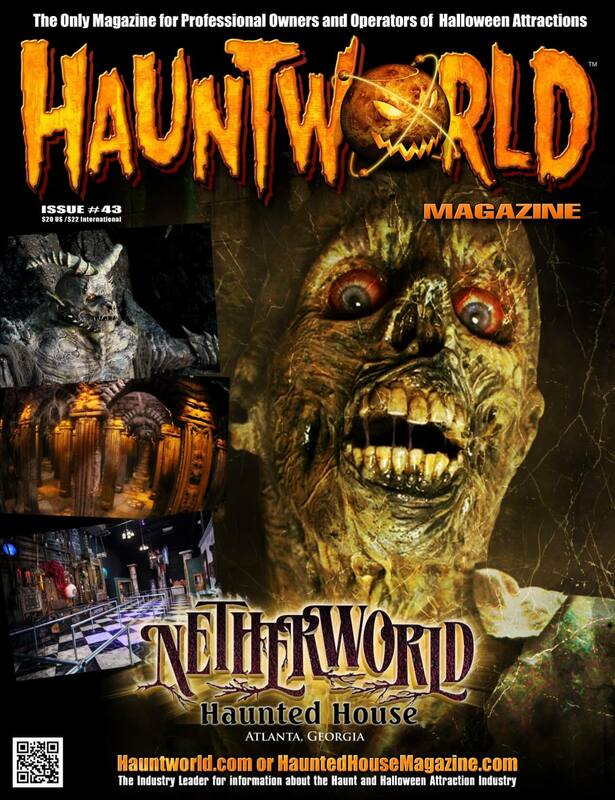 Hauntworld Magazine Issue 33 features two major haunted houses including Bennetts Curse and Pure Terror Haunted House and several how to articles from Netherworld's Ben Armstrong, Allen Hopps, and much more. 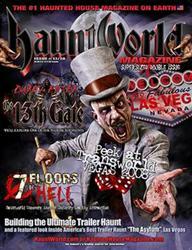 Learn how to make your haunted house more successful with Hauntworld Magazine. 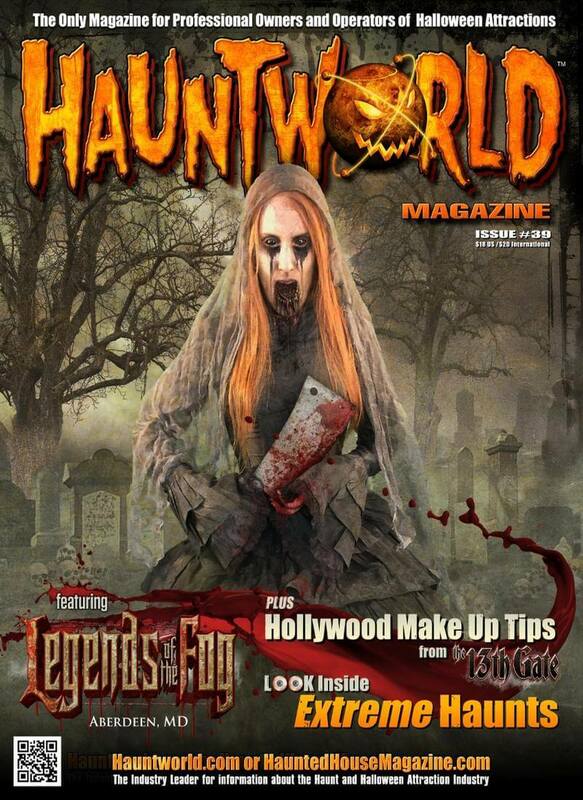 Hauntworld Magazine Issue 31 features Screampark Haunted House and a review of Cutting Edge Haunted House in Dallas. Additionally a review of all the latest on Zombie Mania, the future of haunted house industry plus the top 10 most unique locations for a haunted house and much more. 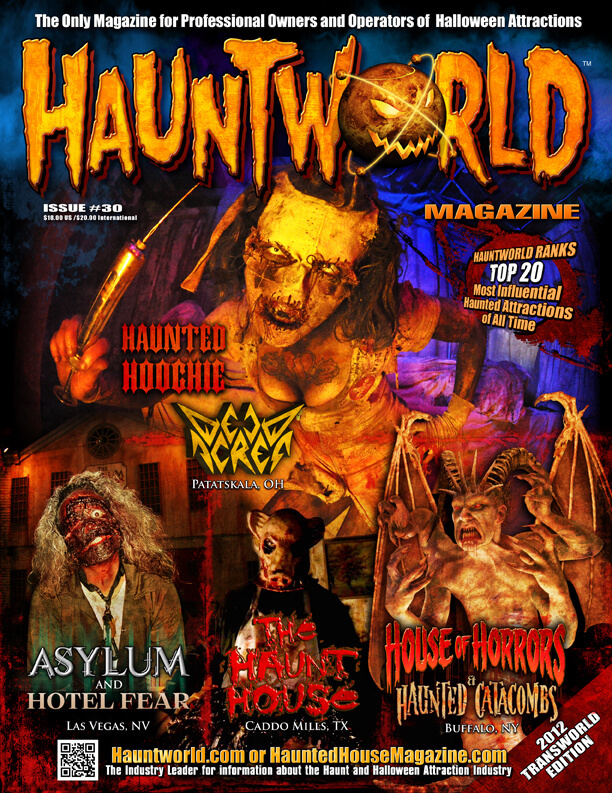 Hauntworld Magazine Issue 30 is the largest all color magazine we've ever produced. Issue 30 includes 76 full color pages featuring four haunted house attractions, top 20 haunts all time, how to create a giant outdoor monsters 'clownzilla' and much more. 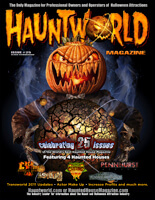 Hauntworld Magazine Issue 29 is the largest all color magazine we've ever printed with over 80 pages of content. Learn how to make a giant clownzilla, or how to entertain your customers in line at your haunted house. Learn more about the 13th Floor Haunted Houses and much more. Subscribe today and save or buy this single issue. 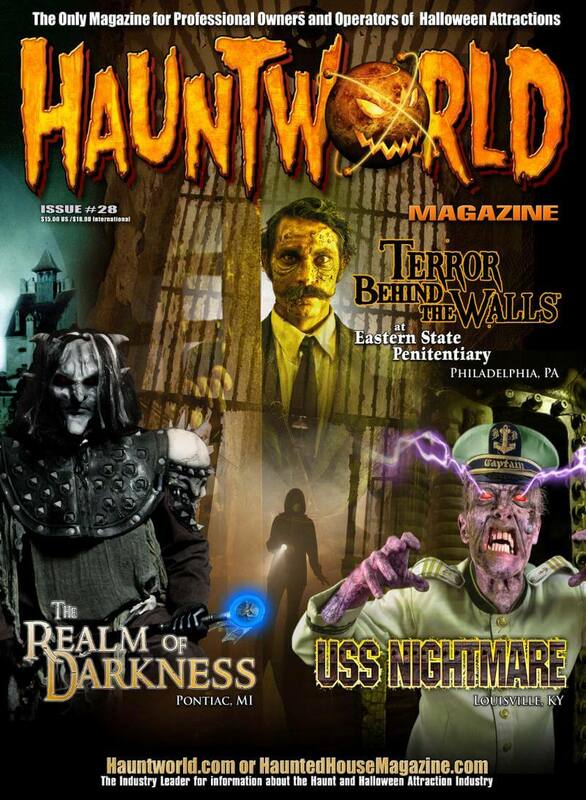 Hauntworld Magazine features three amazing haunted houses including USS Nightmare, Realm of Darkness and the massive Terror Behind the Walls. • QR Codes and more! Hauntworld Magazine issue 26 is jam packed with three featured haunted houses, and in addition learn how to improve air throughout your haunt, haunt show information and much more. 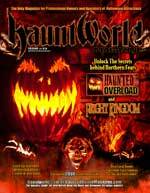 Hauntworld Magazine Issue 25 is the biggest issue to date with feature articles on FOUR major haunted houses. Additionally learn how to expand your attraction with several how to articles. We are all SOLD OUT and do not anticipate printing more at this time.